1:20pm – .90 Cents Admission. WAR IS HELL – Partial version – This is a Aviation Cinemas restoration compiled of two versions : a Super 8mm silent version scanned by The Texas Theatre/ Texas MicroCine and scored by Jason Reimer + one synch sound 16mm reel scanned in Europe featuring the intro by Texas war hero Audie Murphy. “removed” by The Dallas Police Department a few min later. 2:45pm – .90 Cents Admission. 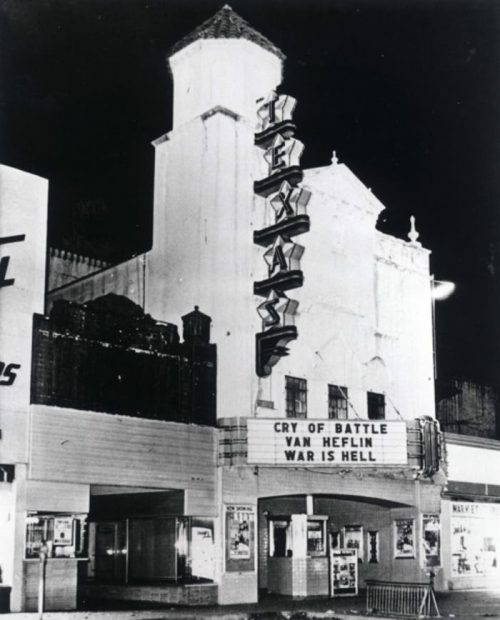 CRY OF BATTLE – Partial version of the Van Heflin and Rita Moreno WWII film that probably never actually screened on 11-22-63 but was famously on the marquee!